Men on a Mission started teaming together for George South as “The Harlem Knights” — Nelson & Bobby Knight.. The Harlem Knights signed WWF developmental contracts and worked for the United States Wrestling Association..
Men on a Mission would come to the ring while their manager, Oscar, rapped his M.O.M. theme song. July 4, 1993 – Wrestling Challenge: Men on a Mission defeated Barry Hardy and Duane Gill. July 10, 1993 – Superstars: Men on a Mission defeated Chad Miller and Mitch Bishop. July 19, 1993 – RAW: Men On A Mission (Mabel & Mo w/Oscar — debut) defeated Rich Myers & Hank Harris. ~~~~Mabel & Mo entered with their manager Oscar who would rap while MOM made their entrance to the ring..
July 25, 1993 – Wrestling Challenge: Men on a Mission defeated Glen Ruth and John Rechner. July 31, 1993 – Superstars: Men on a Mission defeated The Brooklyn Brawler and Brian Costello. August 15, 1993 – Wrestling Challenge: Men on a Mission defeated Reno Riggins and Gus Kantarakis. August 16, 1993 – RAW: Men On A Mission w/Oscar defeated Iron Mike Sharpe & Barry Horowitz. August 21, 1993 – Superstars: Men on a Mission defeated Jeff Libolt and Iron Mike Sharpe. September 4, 1993 – Superstars: Men on a Mission defeated Russ Greenberg and Mark Thomas. September 26, 1993 – Wrestling Challenge: Men on a Mission defeated Red Tyler and Chad Miller. October 4, 1993 – RAW: Mabel participated in a 20-Man Battle Royal for the Intercontinental Title..
October 25, 1993 – RAW: Men On A Mission w/Oscar defeated Todd Mata & Steve Greenman. October 31, 1993 – Superstars: Men on a Mission defeated The Quebecers by count-out. November 8, 1993 – RAW: Men On A Mission w/Oscar defeated Corey Student & Steve Smyth. November 13, 1993 – Superstars: Men on a Mission defeated Chuck Greenlee and Iron Mike Sharpe. November 24, 1993 – Survivor Series: Four Doinks defeated Bam Bam Bigelow’s Team..
~~~(Team Doink) The Bushwhackers (Luke & Butch) & Men On A Mission (Mabel & Mo w/Oscar)..
December 4, 1993 – Superstars: Men on a Mission defeated Gus Kentarakis and Steve Smyth. December 20, 1993 – RAW: Men On A Mission w/Oscar defeated Duane Gil & Barry Hardy. December 25, 1993 – Superstars: Men on a Mission defeated Iron Mike Sharpe and Mike Bell. January 2, 1994 – Wrestling Challenge: Men on a Mission defeated Chris Duffy and Reno Riggins. January 24, 1994 – RAW: The Headshrinkers defeated Men On A Mission w/Oscar. January 29, 1994 – Superstars: Men on a Mission defeated Joey Stallings and Terry Austin. February 6, 1994 – Wrestling Challenge: Men on a Mission defeated Fidel Sierra and Terry Thomas. February 27, 1994 – Wrestling Challenge: Men on a Mission defeated Chris Duffy and Iron Mike Sharpe. February 28, 1994 – RAW: Men On A Mission w/Oscar defeated The Brooklyn Brawler & Steve Smyth. March 12, 1994 – Superstars: Men on a Mission defeated Todd Mata and Jim Messenger. March 20, 1994–WrestleMania 10: Men On A Mission w/Oscar defeated The Quebecers w/Johnny Polo by Count-out..
March 27, 1994 – Wrestling Challenge: Men on a Mission defeated Derek Domino and Mike Bell. March 29, 1994 – WWF in England: Men On A Mission w/Oscar defeated The Quebecers w/Johnny Polo to win the Tag Team titles! ~~~~Mabel (from Men on a Mission) accidentally fell on Quebecer Pierre and knocked him out temporarily for the pin. March 31, 1994 – WWF in England: The Quebecers w/Johnny Polo defeated Men On A Mission to regain the Tag Team titles! April 11, 1994 – RAW: The Quebecers (Pierre & Jacques) defeated Men On A Mission w/Oscar. April 24, 1994 – Wrestling Challenge: Men on a Mission defeated Emilio Ulaca and Iron Mike Sharpe. May 9, 1994 – RAW: Mabel w/Oscar defeated Mike Bell. June 16, 1994–King of The Ring: Mabel w/Oscar defeated Pierre Oulette w/Johnny Polo in a KoTR Qualifying Match..
~~~~ Irwin R. Schyster defeated Mabel w/Oscar in the Quarter-final Match..
June 27, 1994 – RAW: Mabel w/Oscar defeated Bam Bam Bigelow by Count-out! July 18, 1994 – RAW: Mabel w/Mo & Oscar defeated Austin Steele. August 15, 1994 – RAW: Mabel w/Mo & Oscar defeated Raymond Roy. August 29, 1994–SummerSlam: “Double J” Jeff Jarrett defeated Mabel w/Oscar. October 10, 1994 – RAW: Mabel w/Mo & Oscar defeated Reno Riggins. November 14, 1994 – RAW: Mabel w/Mo & Oscar defeated The Blue Phantom. ~~~~Million Dollar Corporation: King Kong Bundy & Tatanka & Bam Bam Bigelow & The Heavenly Bodies..
~~~~All-American’s: Lex Luger & Adam Bomb & The Smoking Gunns (Billy & Bart Gunn) & Mabel w/Oscar..
~~~~Bam Bam Bigelow w/Luna Vachone & The Headshrinkers (Samu & Fatu) & Bastien Booger..
January 16, 1995 – RAW: Mabel w/Oscar & Mo defeated Lee Toblin. January 28, 1995 – Superstars: Men on a Mission defeated Scrubs. January 30, 1995 – RAW: King Kong Bundy defeated Mabel w/Oscar. February 6, 1995 – RAW: King Kong Bundy & Irwin R. Schyster & Tatanka beat Lex Luger & Men On A Mission. February 9, 1995 – Wrestling Challenge: Men on a Mission defeated David Sierra and Barry Horowitz. February 12, 1995 – Wrestling Challenge: Men on a Mission defeated Adam Croom and Butch Long. March 4, 1995 – Superstars: Men on a Mission defeated Dennis Knight and Black Phantom. March 26, 1995 – Wrestling Challenge: Men on a Mission defeated Gary Sabough and Ken Raper. April 1, 1995 – Superstars: Men on a Mission defeated Scrubs. April 3, 1995 – RAW: Men On A Mission w/Oscar defeated Ben Jordan & Tony Roy. Mabel & Mo would eventually turn heel when they attacked their friends including their manager Oscar..
May 1, 1995 – RAW: Men On A Mission squashed Kevin Krueger & Bill Duke. May 13, 1995 – Superstars: Men on a Mission defeated Scrubs. May 14, 1995–In Your House #1: Mabel w/Mo defeated Adam Bomb in one minute 53 seconds. May 27, 1995 – Superstars: Men on a Mission defeated Ross Greenberg and Tim McNeanny. May 29, 1995 – RAW: Men On A Mission squashed Gary Scott & Aaron Ferguson. June 25, 1995–King of The Ring: Mabel w/Mo defeated Adam Bomb in a KoTR Qualifying Match..
~~~~Mabel w/Mo defeated The Undertaker w/Paul Bearer in the Quarter-final King of the Ring Match..
~~~~Mabel received a bye into the finals. Mabel w/Mo defeated Savio Vega to win the King of The Ring! June 26, 1995 – RAW: King Mabel w/Sir Mo defeated Kenny Kendall..
July 8, 1995 – Superstars: Men on a Mission defeated The Smoking Gunns. 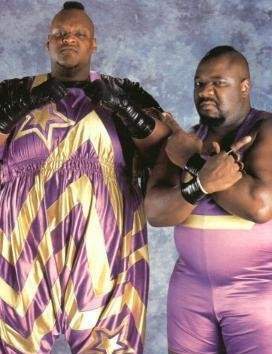 July 23, 1995 – In Your House #2: Men On A Mission defeated Razor Ramon & Savio Vega..
July 31, 1995 – RAW: King Mabel w/Sir Mo defeated Nick Barberry. August 7, 1995 – RAW: “Big Daddy Cool” Diesel defeated Sir Mo. August 21, 1995 – RAW: Men On A Mission defeated Roy Raymond & Joe Hanlock. August 27, 1995–SummerSlam: “Big Daddy Cool” Diesel defeated King Mabel w/Sir Mo to retain the WWE Championship! September 18, 1995 – RAW: Yokozuna & Owen Hart defeated Men On A Mission. November 13, 1995 – RAW: King Mabel w/Sir Mo defeated Roy Raymond. November 20, 1995 – Survivor Series: The Dark Side defeated The Royals in an Elimination match..
~~~~The Dark Side = The Undertaker w/Paul Bearer & Savio Vega & Fatu & Henry O. Godwinn..
~~~~The Royals = King Mabel w/Mo & Jerry “The King” Lawler & Isaac Yankem D.D.S. & Hunter Hearst Helmsley..
November 27, 1995 – RAW: The Undertaker w/Paul Bearer defeated Sir Mo w/King Mabel.